The millions of individuals that have visited the Indiana Dunes State Park have also, unbeknownst to most, entered the former site of a town that attempted to rival upstart Chicago in the 1830s. Chicago, with a population of 100 in 1830, was competing with multiple villages along the southern shoreline of Lake Michigan with the goal of being the principal transportation point in the rapidly growing Midwest. Some of these competing towns were "dream cities," known only as a plat on a piece of paper. Other towns, however, physically existed; had they received funding to support opportunities for growth, then they may have been the alternate to Chicago. Ultimately, decisions were made and the majority of government support was funneled to support Chicago. By 1840, Chicago's population had exploded to nearly 4,500. Presented here is a history of what was to be Porter County's Chicago - City West - and the circumstances that led to its establishment and demise. 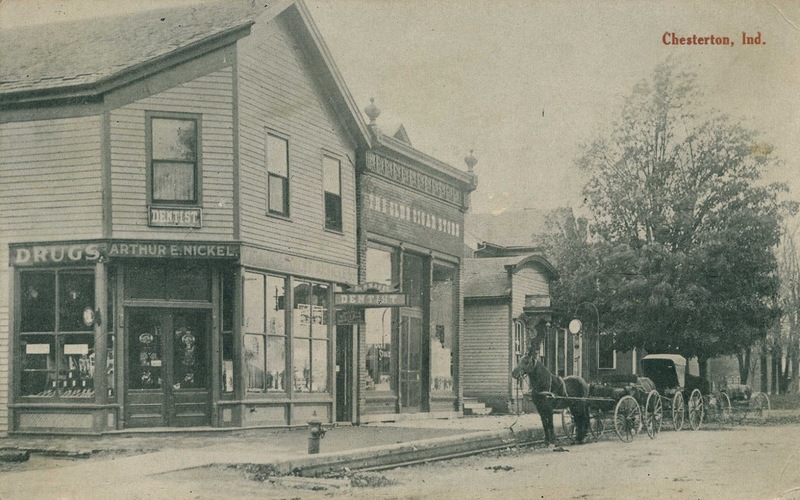 The first officially platted and recorded town in Porter County was City West. The original plat of City West, dated June 10, 1837, was recorded by the Porter County Recorder's Office on July 14, 1837. The plat was filed by Jacob S. Bigelow, President of the Michigan City and Kankakee Railroad Company. 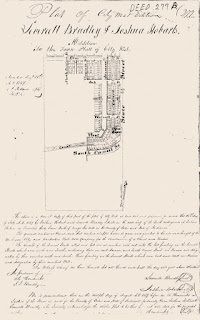 Bigelow, along with Warren Cole, Joshua Hobart, Joshua Leach, and Robert Stewart, were granted a patent by the Government Land Office for the land on which City West was situated on March 20, 1837 (W½ of the NE¼ of Section 13, Township 37 North, Range 6 West, comprising 75.73 acres). These same men were also granted a patent for the adjacent 160 acres south of City West (SE¼ of Section 13). Original plat of City West, Porter County, Indiana, recorded July 14, 1837. Source: Porter County Recorder's Office, Deed 262. The within is a copy of the Town plat of City West situate on Section thirteen Township No. thirty seven north of Range No. Six West in the County of Porter and State of Indiana, as laid off and prepared for Record this tenth day of June 1837 by Jacob Bigelow, President of the Michigan City and Kankakee Rail Road Co., in trust for the uses and benefits of said company. The ground marked as "lower Basin" at the mouth of Fort Creek and so much of the Canal as is sited above, running South of the same is reserved and granted to the use and benefit of the said Michigan City and Kankakee Railroad Company for the construction of the necessary Basins and Canals. That marked and laid down as Canal from State Street to Fort Creek and running northwestwardly is reserved in the same manner. So much of the ground as is marked and laid out as Canal from Fort Creek eastwardly is granted for a Canal provided the Michigan City and Kankakee Railroad Company of the State on the State of Indiana shall occupy and improve the same and such within thirteen years, but of the same shall not be so occupied and improved within the time aforesaid then and in that case it shall be reduced to a twenty five feet alley to [illegible word] the same, and the land on each side of said alley shall attach to the adjoining lots and shall vest in the owners of the said adjoining lots. The widths of the several streets, alleys and lots are as marked in red ink; the lots fronting on the several streets which run north and south, including those on West Avenue, South Canal, North Canal, Chicago, Pearl and Water Streets, are known and designated by their numbers north and south; those fronting on the several streets which are east and west including East Avenue are known and designated by their numbers east and west. In Witness whereof I have hereunto set my hand and seal the day and year above written. Michigan City and Kankakee Railroad Comp. Before me Cyrus Spurlock, Recorder of said County personally came Jacob Bigelow, President of the Michigan City and Kankakee Railroad Company in trust for said company, proprietors of the within Town Plat and acknowledged it to be for the uses and purposes therein specified. Given under my hand and seal this 12th day of July A.D. 1837.
contained the community of City West, Indiana (March 20, 1837). Office Records, Accession Number IN1640.118. Soon after the initial plat of City West was recorded an addition to the plat was made dated July 25, 1837, and this was officially recorded on August 18, 1837. The addition plat was filed by Leverett Bradley and Joshua Hobart. Porter County, Indiana, recorded August 18, 1837. Source: Porter County Recorder's Office, Deed 277. The above is a correct copy of that part of the plat of City West as laid out and prepared for record this 25th day of July A.D. 1837 by Joshua Hobart and Leverette Bradley Situate on the west half of the south west quarter of Section thirteen in Township Thirty Seven North of Range Six west in the County of Porter and State of Indiana. 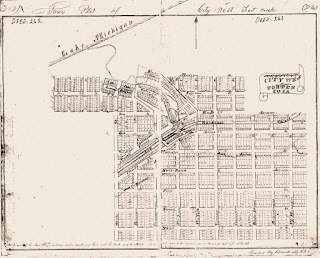 The ground marked as Canal, and that marked as Upper Basin is given and granted to the use and benefit of the Michigan City and Kankakee Rail Road Company for the Construction of a Canal and Basin. The widths of the several street alleys and lots are as marked with red ink; the lots fronting on the several streets which run north and south, including those on West Avenue, and South Canal Street are known and designated by their numbers north and south. Those fronting on the several streets which run east and west are known and designated by their numbers west. In Witness whereof we have hereunto set our hands and seals this day and year above written. Jacob S. Bigelow's plat specifically mentions Fort Creek. Today, Fort Creek is known as Dunes Creek; the mouth of the creek is located immediately east of the pavilion at the Indiana Dunes State Park. Individuals writing about City West in the past have failed to investigate the lives of the developers - they are simply mentioned by name and have become abandoned memories. Nor have they examined City West in perspective of the time and place of it origination. Research, however, yielded information about some of these men, and piecing this information together revealed that they were rather extraordinary individuals. In particular, information compiled from dozens of sources allowed for the development of biographical descriptions for Jacob S. Bigelow, Leverett Bradley, and Joshua Hobart. Unfortunately, few clues could be found to provide reliable biographical sketches about Warren Cole, Joshua Leach, and Robert Stewart. Born to Miles and Chloe Bradley on November 25, 1798, in Cayuga County, New York, Leverett Bradley left his parents home at the age of 21. He traveled by foot to Ohio where he taught at a school over its winter term. At the conclusion of the term, Leverett walked back to New York and paid his father money which had been loaned him for the trip to Ohio. The winter term of teaching netted Leverett a total of $7. Leverett would travel westward again, eventually ending up at Michigan City, LaPorte County, Indiana. Leverett had studied medicine, probably in Ohio, and became a rather well known physician upon his arrival in LaPorte County; he appears in the 1850 federal census for LaPorte County as L. Bradley, physician. 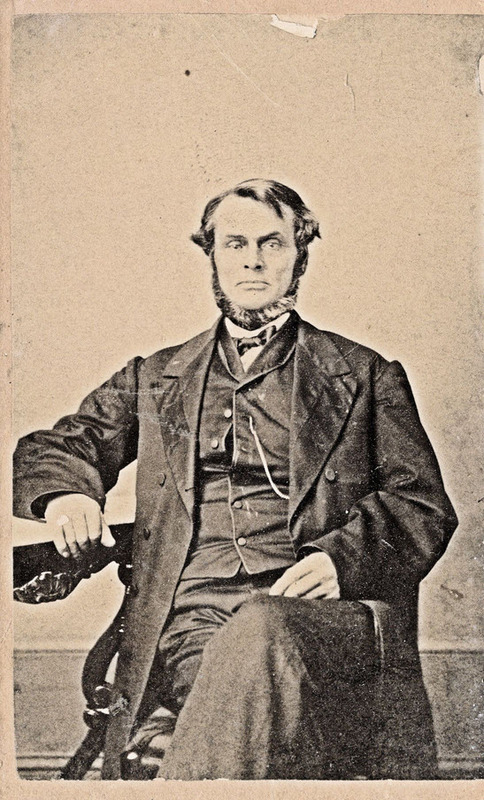 Reportedly tiring of the work as a traveling physician, Bradley moved to California, presumably in late 1850, where he founded and edited the Granite State weekly newspaper and took advantage of the gold rush that was taking place. He was a principal investor in Bradley, Berdan & Company. Incorporated on August 4, 1851, Bradley, Berdan & Company was established for the purpose of "manufacturing, mining, mechanical and chemical purposes" and to further these by claiming water from "Ringgold creek to Cosumnes river or its northern branches, or from some of the southern branches of the American river." Essentially, the company's goal was to convey water from the Cosumnes River to the gold diggings around Placerville, El Dorado County, California. Bradley was described as a "civil engineer." Capitalized with $150,000 raised through four stock offerings, the company completed its project in December 1853. The finished project included a sizable dam on the Cosumnes River, a twenty-seven mile primary canal, and numerous feeder canals; a total of about 100 miles of canal line were excavated. Bradley's investment in canals to supply water to placer mining operations was a major success. Company shares sold well above the par value of the stock, netting investors a 35 percent return within a year of completion of the canal. In 1855, Bradley purchased the Miners' Advocate newspaper and renamed it El Dorado County Journal, the first issue under this title being published on January 1, 1856. Unlike his canal business, Bradley's newspaper venture was a flop and it ceased publication on February 17, 1856, after just six weeks. Also in 1856, Bradley, Berdan & Company consolidated with Jones, Furman & Company to form the Eureka Canal Company. While in California, Bradley became deeply interested in the relatively new and rapidly growing science of telegraphy, devising instruments that could be used to improve the technology. By 1859, Bradley had filed his first patent for an invention to improve telegraph transmission and reception. 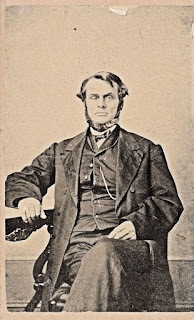 In the early 1860s, due to poor health, Bradley moved to Jersey City, Hudson County, New Jersey, and continued his work improving telegraph technology. Bradley's most noted invention was "Bradley's Fiddle Sounder," a combination galvanometer and rheostat that measured electric forces (US Patent No. 134,636); this invention was used worldwide and Bradley quickly became a significant player in the manufacture and sales of telegraph keys and relays, sounders, and switches. Bradley is also noted as the first manufacturer of galvanometers in America. Aside from telegraph equipment, Bradley also patented a device used to deodorize and improve alcoholic and vinous liquors (US Patent No. 108,558). In the fall of 1869, a young man moved from Elizabeth, Union County, New Jersey, to Jersey City. It was in Jersey City that twenty-two year old Thomas Alva Edison found employment in the experimental shop of Leverett Bradley's electrical instrument manufacturing facility. Edison would soon open his own shop in Newark, Essex County, New Jersey, in mid-February of 1870. It was the Bradley-designed induction coils that Edison used in the manufacture of his first telephones. Bradley died of heart disease at his residence located at 185 Jersey Avenue in Jersey City on September 6, 1875, after living the life of a true renaissance man - an educator, physician, land developer, waterworks engineer, editor and publisher, and inventor. Jacob S. Bigelow and Joshua Hobart were business partners prior to investing in the development of City West. Bigelow had established a hat-making business in January 1826 with William Eydam in New York. This business failed in June 1827. Bigelow and Joshua Hobart, a tanner, then partnered to obtain justice for the heirs of François Cazeau, a wealthy Canadian that sympathized with the American cause during the Revolutionary War. Cazeau was imprisoned in Canada and his property there was confiscated, but he escaped and took refuge in the United States. In 1782, Cazeau directly petitioned Congress for compensation due for his lost Canadian property and the supplies that he had provided to the American revolutionaries. 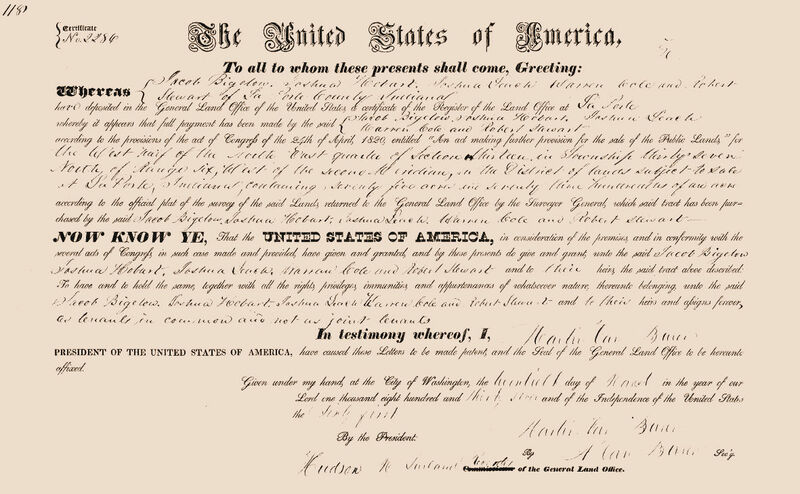 In 1801, Congress granted Cazeau 2,240 acres in New York as remuneration for his losses, but Cazeau did not claim this land and instead insisted that he be compensated with money rather than land. Cazeau would die in 1815 without being financially reimbursed. 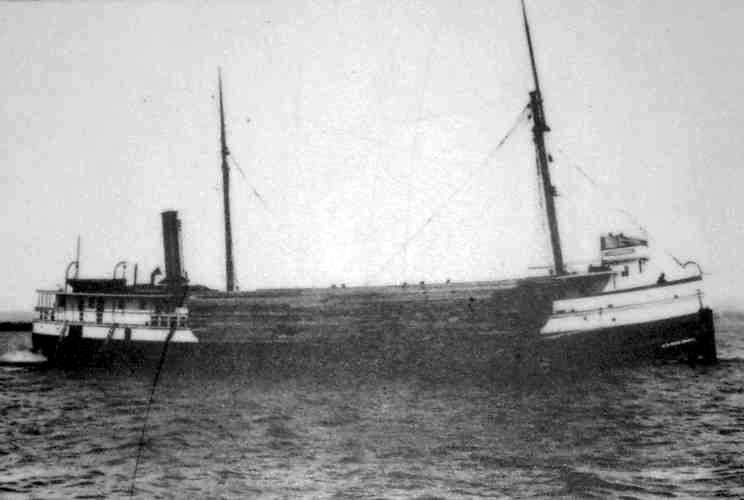 His heirs, however, continued to pursue the claim on behalf of Cazeau's estate and hired Bigelow, Hobart, and Horace Dickinson, an innovator in the Canadian shipping industry, as their agents. Bigelow would be appointed the sole administrator of Cazeau's estate. As agents of Cazeau's estate, these three men would receive one-half of any compensation obtained by Cazeau's heirs from the United States government. 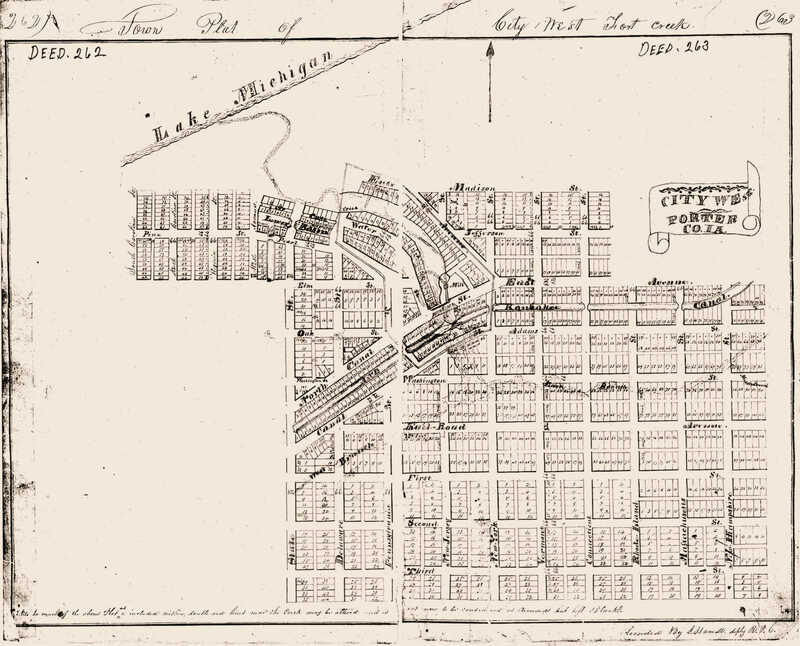 By 1835, Bigelow had moved to Michigan City, where he became involved in the development of multiple railroads ventures and the establishment of City West. In 1844, more than 15 years after pursuing the Cazeau case, Congress agreed to a final settlement with Cazeau's heirs amounting to $27,352 (equivalent to about $700,000 in 2016). It is suspected that Bigelow had moved permanently to Washington, DC, in the early 1840s after City West appeared to be a failing enterprise. In Washington, evidence strongly indicates that Bigelow was earning a living by representing individuals at the United States Court of Claims rather than developing speculative real estate and transportation projects. He was buried at Glenwood Cemetery in that city upon his death on March 26, 1864. As stated in the plat, the intent of the developers and promoters of City West was to transform Fort Creek into a canal. Additional land was reserved by the Michigan City and Kankakee River Railroad Company for expanding the canal. It can be readily inferred from the two recorded plats that the canal was to serve as a port. The Michigan City and Kankakee River Railroad was incorporated on February 7, 1835, about one year prior to the formation of Porter County. The railroad was organized by Jacob Bigelow, David Burr, Joshua Hobart, and David Sprague, all residents of Michigan City at the time of incorporation. The company was formed with the objective of "constructing a canal or railroad from Michigan City to the navigable waters of the Kankakee River...."
It is evident that City West was being established as a transportation hub. The Michigan City and Kankakee River Railroad would provide inland rail transportation for goods going to or from City West's canal harbor, yet to be constructed. Jacob Bigelow and David Burr would also invest in land situated between Michigan City and what would become the community of Furnessville, likely in anticipation of the commercial development of City West. 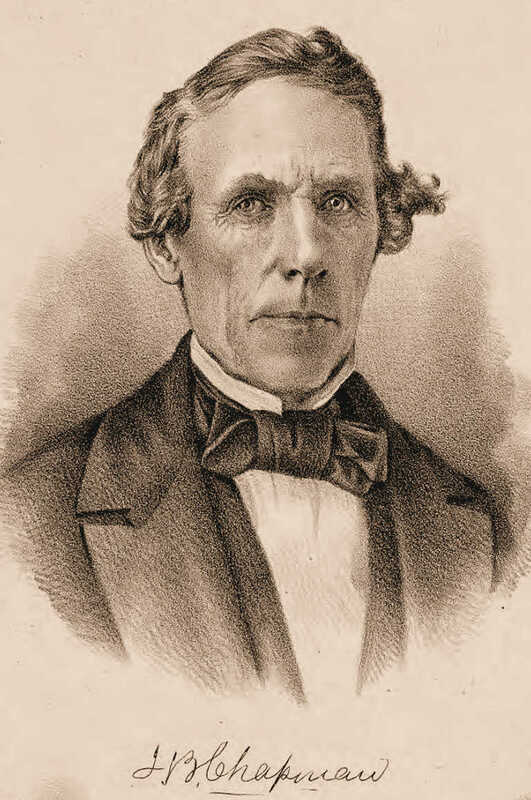 At the time of the founding of the Michigan City and Kankakee River Railroad, David Burr, one of its organizers, had been removed as the Indiana Commissioner of Canals, a position he was appointed to around 1828. After being appointed commissioner, Burr would go on to found the community of Wabash, Indiana, in Wabash County; his purpose in the establishment of Wabash was to intersect the Wabash River with the Erie Canal. He was removed as Commissioner of Canals due to allegations related to the inappropriate use of public funds. By 1835, Burr had sold his real estate interests in Wabash to Hugh Hanna for $10,000 and 400 acres of land and moved to Fort Wayne, Allen County, Indiana. By May 1839, Burr was residing in LaPorte County, Indiana, and he appears in the 1840 federal census for that county. 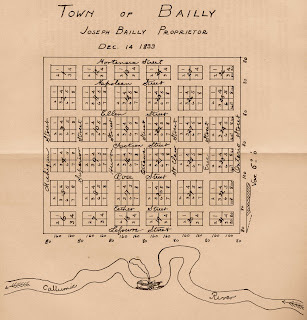 An additional individual should be mentioned prior to exploring the history of City West, and that person is Joseph Bailly, Porter County's first permanent white settler. Bailly passed away on December 21, 1835. The administrators of his estate, Alexis C. Bailly and Mary Bailly, wrote to Jacob S. Bigelow on August 25, 1836, offering to sell one-quarter section of land (160 acres) in Section 13 adjacent to what would become City West (SW¼ of Section 13). Agreeable to the promise made the other day we the administratrix and myself as Administrator on the Estate of Jos. Bailly, deceased will, which please to look upon as, submit two propositions independent of the partial understanding entered into on the 23rd inst. either of which said propositions if acceded to will annul the minutes of that day. 1st. We will sell the qr. of Sect. 13 near City West on the following terms, say six thousand dollars to be paid as follows, two thousand dollars Cash down two thousand dollars nine months from the date of the first payment and two thousand dollars nine months from the last, bearing interest at the rate of six per cent until paid, you will also obligate yourself to give to said estate free of charge Six choice Lots in City West, and to make a Canal in a specific time to run along the marsh up to the Junction of Salt Creek with the Calimic paying to said estate for whatever lands or material you may want of said estate to effect the project in contemplation at a fair valuation. 2nd. We are willing to make a sale of the quarter of Section 13 near City West without any further condition for the sum of Eight thousand dollars, paid as follows, four thousand dollars cash down, two thousand dollars one year from the date of the first payment and two thousand dollars one year from the date of the last payment, bearing interest at the rate of six per cent until paid, and six choice lots as above stated. Should you prefer to either of the above propositions the partial contract already entered into, Mr. John H. Whistler whom Mr. Bailly has appointed his attorney will sign for him any contract, the basis of which will be the minutes taken on the 23rd inst. Interestingly, the Bailly estate administrators' letter specifically mentioning "choice lots" in City West predates Bigelow's platting of the town by nearly one year. This suggests that City West may have physically existed as a community prior to the filing of the plat with the Porter County Recorder, or perhaps it was well known that land speculators were intending to develop a community along the Lake Michigan shoreline at Fort Creek. "...the judge was obstinate, and in defiance of all laws governing the actions of probate court, forced Grandmother and her daughters, whom he treated as unreasonable women, to be coerced into subjection, to accept as an administrator the one whom they had the most reason to dread, a man against whom Grandfather had specially warned them. Of course, Grandfather's prudence in winding up all his business and settling all his affairs absolutely prevented this person from doing all the harm he wished to do, but he did embezzle a considerable amount, his conduct being so boldly dishonest that he was brought before the grand jury in a very short time, charged with fraudulent conduct. A true bill was found against him, he did not wait to stand trial, but fled into the far west, in those days the safe refuge for all such characters. It is believed that Howe's story carries no ounce of truth since it is documented that Marie [Mary] and Alexis C. Bailly, Marie's stepson, served as co-administrators of Joseph Bailly's estate. Howe cannot be referring to Alexis as the embezzler; Alexis was a well-respected pioneer of Minnesota and served as a member of the first territorial legislature of that state. The most far-reaching of all this man's dishonorable acts, related to the town and harbor in which the family fortunes had been bound up. Grandfather had withdrawn from the scheme, but he left to his family, the extensive tract of land alongside the river, and if his Eastern colleagues desired to continue their efforts to establish a lake harbor on the spot, favorably reported to them by Grandfather, there was nothing to prevent them. In a point of fact they did so, securing from Congress a promise of a special appropriation, provided the Congressional committee, sent out to inspect the lake coast, would approve the site. Those favoring opposing interests soon formed their plans, the administrator aforesaid, was easily bribed to give them aid in the prosecution of their underhanded schemes. Nearly ten miles east of the mouth of the Old Calumet, a wild-cat town, or rather a village was hastily constructed on a very disadvantageous site, a narrow strip of lake beach shut in by barren sand dunes of great height. There was a narrow gap in the range of sand hills, through which a rather wide but shallow brook wound around onto the beach, filtering its meager supply of water, through a large sand bar into the lake. Transient inhabitants for the transient village were easily found among the eastern farmers, eager to emigrate west, and the town was ready for the inspection of the committee, who were conducted to it by the duly authorized administrator of the estate of Joseph Bailly, keenly enjoying the ridicule with which the memory of the dead was assailed, when the committee perceived the utter absurdity of planning a town, where there was neither building site, or harborage. City West, indeed, had relatively intense competition in attracting the ingredients required to establish a growing and thriving city, these ingredients being residents, business, industry, and transportation infrastructure. Those communities competing directly with City West are briefly outlined below. Town of Bailly. 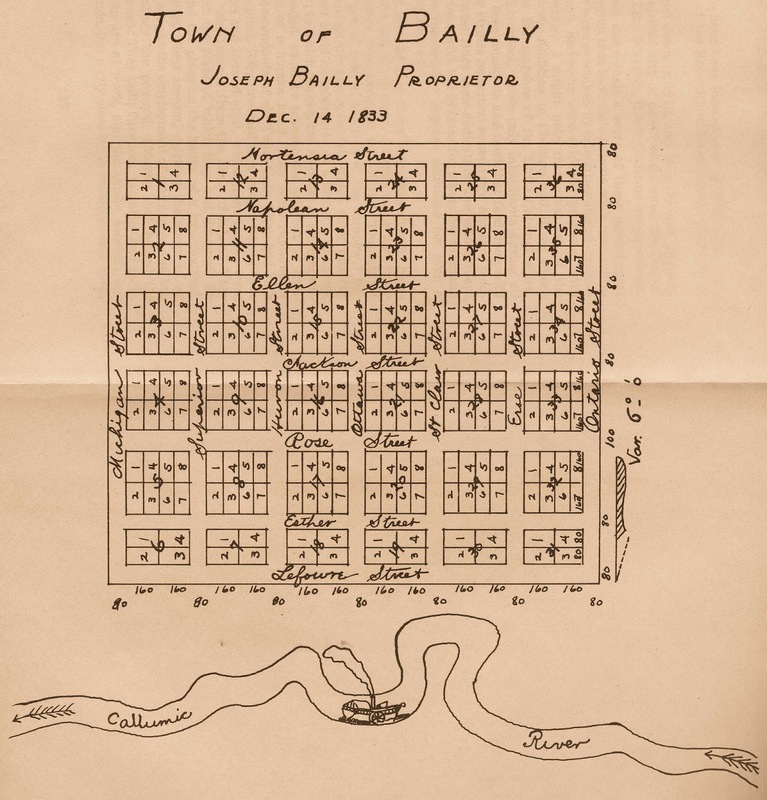 Joseph Bailly had platted a community that he named after himself, Town of Bailly. His plat bears the date of December 14, 1833, and it was legally recorded at LaPorte County, Indiana (as Porter County did not yet exist). Bailly's village was located in the SE¼ of Section 28, Township 37 North, Range 6 West, along the north bank of the Little Calumet River and one mile west of present day Bailly Homestead. Plat of the Town of Bailly, Westchester Township, Porter County, Indiana. Source: Bowers' "Dream Cities of the Calumet," 1929. Considerable speculation existed at the time Bailly platted his village that a railroad would be established either through or adjacent to Bailly's property. There was also some expectation that a canal would be excavated, most likely connecting the Little Calumet River, which coursed through Bailly's property, to Lake Michigan. Bailly contracted with Daniel Greene Garnsey, a former United States Representative from New York, to act as his agent in selling the platted lots. Bailly advertised the sale of lots in the Chicago Democrat newspaper. A handful of lots in the Town of Bailly are believed to have sold, but Joseph Bailly's death in 1835 put a immediate halt to sales and the development of the town. Ironically, the name Baillytown was used to describe the area (and Bailly Homestead to the east) for nearly a century after Joseph Bailly's death, despite that there was no village to speak of. About fifteen to twenty years after Joseph Bailly's death, the Town of Bailly area did become populated with a significant number of Swedish immigrants. Their migration there was in large measure due to Joel Hoxie Wicker, Joseph Bailly's son-in-law. Wicker attracted the Swedes when he sold his general store to the them to use as a church. The Swedes would also purchase log slabs from Wicker's nearby sawmill and construct shelters on small plots of land sold to them by Wicker. Thus, the area was also commonly referred to as Slab City for many years before reverting back to the name of Baillytown. As an aside, the Wicker Park neighborhood in Chicago was laid out by Joel H. Wicker and his brother Charles in 1870, soon after the Great Chicago Fire. Indiana City. Land promoters from Columbus, Franklin County, Ohio, recorded a plat for Indiana City dated May 13, 1837, about three months after the establishment of Lake County. Robert Stewart, a land speculator and promoter of City West, was also a promoter of Indiana City. 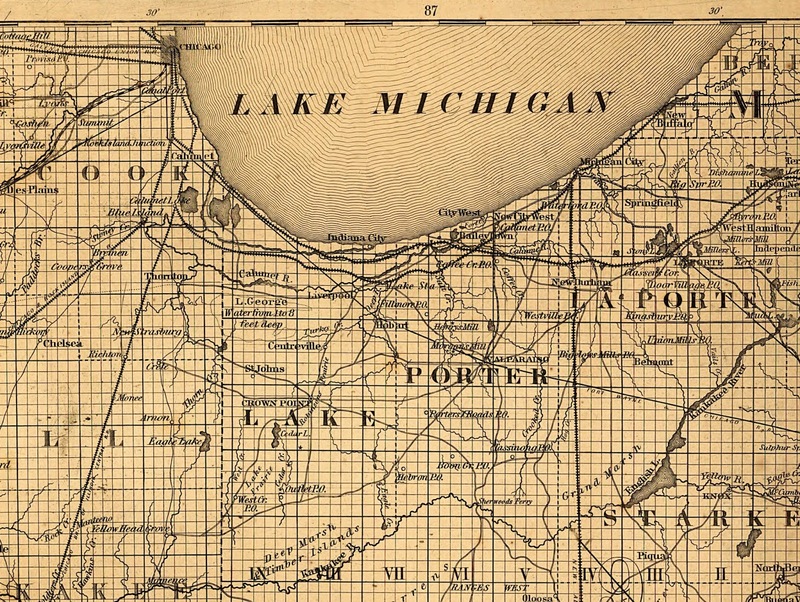 Like City West, Indiana City was located along the shoreline of Lake Michigan; it was situated at the eastern mouth of the Grand Calumet River. 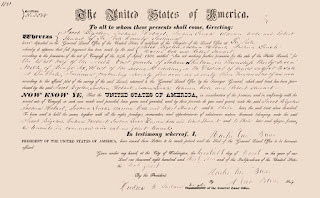 In February 1839, the topic of appropriating $500 for a survey and cost estimate of a harbor at Indiana City was taken up by the United States House of Representatives' Committee of the Whole as an amendment to an Act Establishing the Territorial Government of Wisconsin. The debate concerning this amendment was both humorous and foretelling. One issue was that congressmen were unaware of the physical location of Indiana City. During debate of the amendment, one congressman fixed Indiana City as being "north of the equator," which drew considerable laughter among his colleagues. Meanwhile, Congressman Charles Eaton Haynes (Georgia) believed that Indiana City was located in Wisconsin. Mr. GARLAND, of Va. alluded to the multitudinous dips which were made in the purse of the People, to subserve the views of speculators, who purchased vast quantities of land, then came to Congress to get appropriations for harbors, &c. to enhance the prices, and then sold out. Numerous had been the applications for harbors on Lake Michigan -- for more harbors than would ever be constructed, and for the benefit of more cities than ever would be built. After all [the debate] that had passed, the exact spot on which Indiana city was located had not been found; and yet this was talked of as a great rising city, which (he supposed) was to rival Canton, London, or Paris. It was an application for money to construct a Harbor where Nature had decided there never should be one -- at the mouth of the Calumet, and for the benefit of speculators in lots. As to the $500 he cared nothing; it was the principle against which he contended. Pass this, and there would be applications to construct a dozen more harbors at a dozen more cities which were not to be found. and estimate of harbor at Indiana City. Source: The Madisonian, February 14, 1839. [Indiana City is] In the clouds, not upon earth. If the gentleman would cast his eye upon the map, he would perceive that Salt river [Salt Creek in Porter County] was about twenty miles further on. He took that the House should forthwith row this proposition [Amendment] up that celebrated stream." And row they did. The amendment to appropriate $500 for a survey and estimate of a harbor at Indiana City was struck from the bill. It is unknown whether any lots were sold or if any structures were ever constructed at Indiana City. Like the Town of Bailly, this community appears to have failed to physically exist. The lack of congressional funding was the proverbial nail in Indiana City's coffin. The debate likely had deleterious effects on the other speculative developments along Lake Michigan as well. Today, the Gary neighborhood of Miller Beach is located upon the former site of Indiana City. Liverpool. The community of Liverpool was platted by John B. Chapman, who coincidentally named the town of Warsaw and the county of Kosciusko in Indiana. Chapman was a notorious land and railroad speculator throughout North America - from the Midwest, to Texas, to Alaska. He located Liverpool at the confluence of the the Little Calumet River and Deep River in Lake County (Section 24, Township 36 North, Range 8 West). 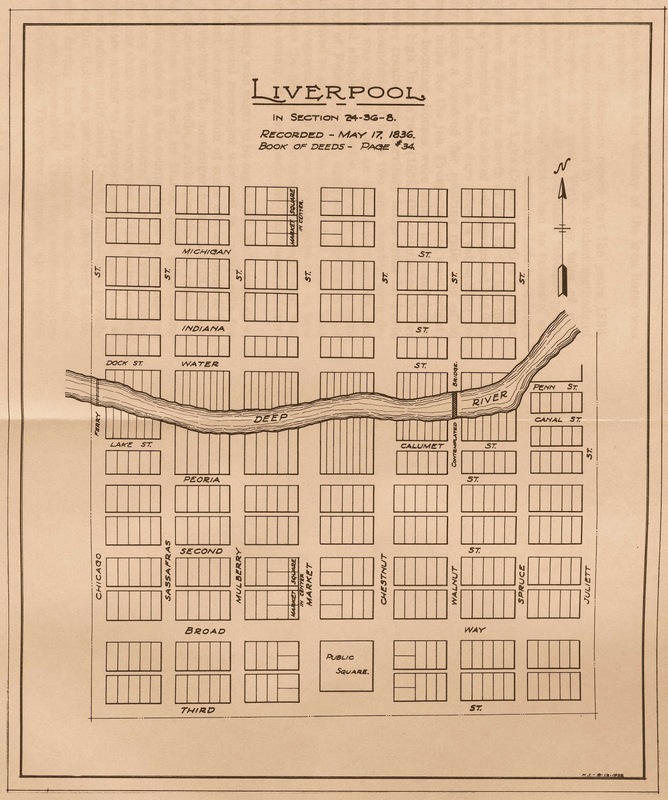 Chapman envisioned that Liverpool, established in 1836, would become a significant harbor town competing directly with Chicago as a transportation hub. of Liverpool, Lake County, Indiana. George Earle owned considerable acreage near Liverpool and lobbied for this community to be the county seat for the newly established Lake County, which had been carved off of Porter County. Indeed, Liverpool was the county seat of Lake County for about three years. In 1840, a petition to remove the county seat from Liverpool to Crown Point was presented, which would centrally locate the seat of government The petition was approved by the county commissioners, thus moving considerable business away from Liverpool. 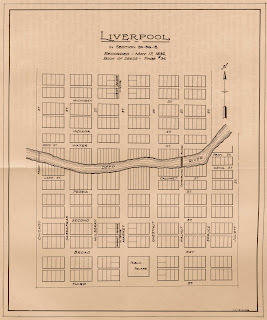 Plat of Liverpool, Hobart Township, Lake County, Indiana. Liverpool's county courthouse, built in 1839, was dismantled and floated downriver to Blue Island, Cook County, Illinois, in 1844, where it was reassembled and became the American House Hotel. The court house structure still stands today where it is used as a private residence. 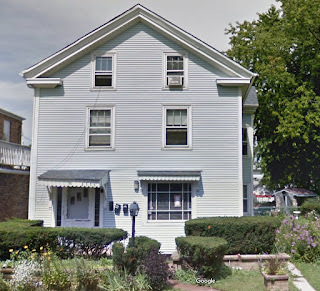 structure is now a private residence at 2336 Collins Street in Blue Island. Source: Google Maps, August 2014. The nearly 500 residents of Liverpool dispersed, and George Earle would move a bit further south as found the community of Hobart, Indiana. A fire swept through the remains of Liverpool in the late 1840s, displacing the last two families that had remained there. Today, Lake Station is located at the former site of Liverpool. Manchester. 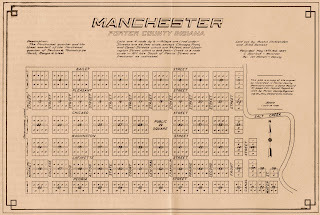 On May 13, 1837, Austin Chittenden and Silas Lamson, both residents of LaPorte County, recorded a platted 200 acre parcel of land at the mouth of Salt Creek in Portage Township and named it Manchester. The location was strategic in that the Chicago-Detroit Road ran through Manchester and crossed the marsh on Long Bridge. Manchester was failure, most likely the victim of the financial panic of 1837 that began three days prior to the recording of the plat. 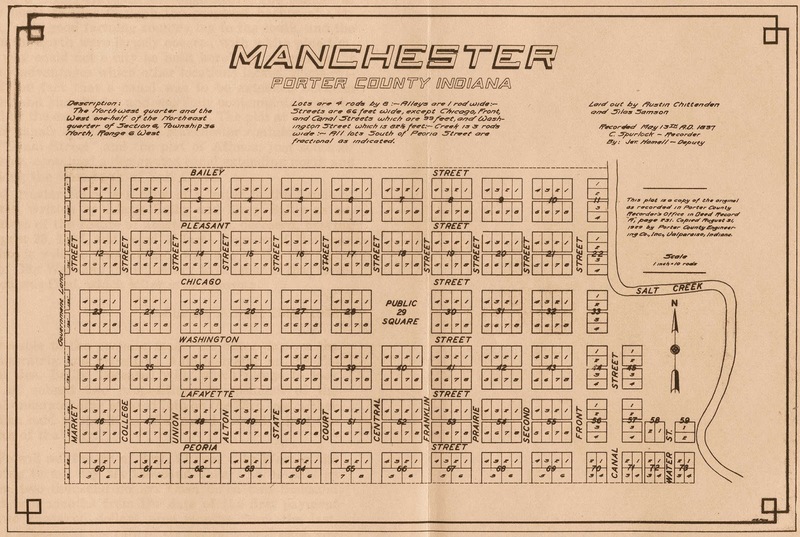 Plat of Manchester, Portage Township, Porter County, Indiana. Michigan City. Founded in 1830 by land speculator Major Isaac Compton Elston, Michigan City in LaPorte County was one of the few communities in northern Indiana that would survive the land speculation and canal craze of the 1830s. It competed directly with Indiana City and City West to be a major transportation node along Lake Michigan. Waverly. Jacob C. Beck constructed a log cabin near five other cabins in an area platted out by his brother-in-law, John I. Foster, which was located on land that was owned by another brother-in-law, William Gossett. 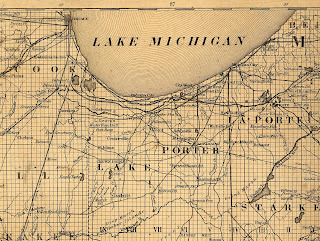 Foster's plat was made during the summer of 1834 and recorded at the courthouse in LaPorte since Porter County had yet to be split off from LaPorte County. Foster named the new community Waverly, probably because it was located in LaPorte County's Waverly Township, later to become Westchester Township when Porter County was officially organized. Foster hoped to develop Waverly into a prosperous lumber town. Beck, Foster, and Gossett had all married Hageman sisters, and all three families resided in neighboring cabins. Waverly was located the intersection of present day Waverly Road and Oak Hill Road. Unlike the other platted communities mentioned here, Waverly was not located directly along a body of water or river, though the Little Calumet River was a close distance away. It was, however, strategically situated between City West and the Town of Bailly and extremely close to the Chicago-Detroit Road. The stage coaches traveling the Chicago-Detroit Road would make stops at Bailly's homestead, Waverly, and City West. While numerous improvements were made, Waverly did not exist long. This particular locale was heavily timbered and the residents needed land that could quickly produce crops. Furthermore, the Town of Bailly was a failure after Joseph Bailly's death in 1835 and City West suffered as a consequence of the financial panic of 1837. Consequently, families living at Waverly moved further south to more open areas and erected saw and grist mills in Liberty Township to develop local commerce and trade. Ultimately, Waverly suffered the same fate as Liverpool; a devastating forest fire swept through the area soon after homesteaders departed and leveled all the structures. Bailey Town, City West, New City West, and Michigan City. Source: Colton's Map of the State of Indiana, 1860. Unlike many platted villages across the American frontier, City West did exist and, for a brief period, thrived to some extent. As previously mentioned, Michigan City was already a small community when City West came into existence, and Indiana City's plat was recorded about a month prior to the City West plat. City West was situated about ten miles from both Indiana City and Michigan City. Interestingly, the names of all three communities include "City," clearly indicating the aspirations of their developers and promoters. Most of City West had been surveyed and physically laid out (staked) during the fall and winter of 1836. Joshua Hobart, possibly in partnership with a Mr. Morse, had also erected a small dam on Fort Creek to power a sawmill. Hobart harvested eastern white pine (Pinus strobus) growing in the immediate vicinity of City West and converted the logs into lumber, the lumber then immeidately sold and used to construct homes, stores, and hotels. When the spring of 1837 opened the place [City West] began to grow rapidly as a new western town. Commodious and quite costly houses were erected; a large building was put up for a store and warehouse; hotels were built ready for being opened to accommodate the travelling public; a survey for a harbor was made, and an appropriation from Congress was expected to enable the proprietors to perform needful work; and everything for a time promised an abundant success. The saw-mill furnished a good supply of lumber and the carpenters were busy putting the lumber into the form of houses. The Exchange House, a twenty-two room hotel owned by Jacob Bigelow, the Bradley Hotel, and a third hotel were quickly erected in City West, as were a general store and a blacksmith shop. One historical source indicates that at least forty structures in total were built in City West, as well as a pier into the lake. Ball also mentions that by spring 1837, up to twenty families were domiciled in City West. These included the families of Ainsworth, Bigelow, Bradley, Ball, Chisleu, Ellis, Hobart, Morse, Muzzall, Sweet, and Wheeler, as well as several unmarried young men. Photograph of Timothy H. Ball. A View of Our Region Through the Nineteenth Century, 1900. ...here he [Timothy Ball] learned something of Indian life, seeing the traveling parties almost every week on their ponies, going to and from the neighboring Baillytown, and visiting at their wigwams the hunting parties that came from Green bay in their large, birchbark canoes, and camped for weeks near the growing village; here he and others formed acquaintances destined to exert an influence through life; here he first saw an Indian burial place and saw Indians mourning over their buried dead; here he learned the intense sadness and loneliness of death in a pioneer settlement and the loneliness of a pioneer burial in the wilderness; and here he learned how colonies were planted in the American wilds. The Indian cemetery referred to in Ball's comment was located upon the dune immediately southwest of the present day pavilion at the Indiana Dunes State Park (thus, directly south-southeast of Porter Beach). In November of 1899, Ball visited Sarah J. Stonex, whose father was Jacob Beck of nearby Waverly. 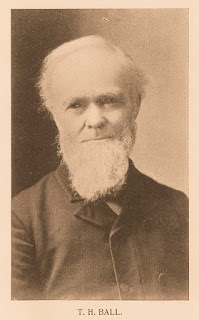 Jacob Beck, a devote Christian and founder of Chesterton's Methodist Church, is the individual that prepared Joseph Bailly's body for burial in 1835 since Bailly's wife and daughters were residing in Chicago for the winter months. During their conversation, Sarah shared an experience with Ball of attending a young girl's burial at City West sixty-two years earlier. Ball was astonished at hearing this since he, too, had attended that same burial service when he was a child. At least one significant historical event took place at City West. On the morning of July 4, 1837, Daniel Webster arrived by two-horse carriage to deliver a speech at City West. Webster had recently been inspecting property that he owned in Illinois and was induced to visit City West. Some reports of the visit indicate that Webster was a bit tipsy from imbibing alcohol. Regardless, the noted American statesman gave his speech touting the importance of City West as a future and notable shipping point of the Midwest. George Albert Brennan writes in his book The Wonders of the Dunes, published in 1923, that "old residents" claimed that Webster was paid $5,000 for the speech unabashedly promoting City West. ...the great 'expounder of the Constitution' came out to be introduced to the inhabitants of City West. There he stood before us, the great lawyer, statesman and orator, tall in form, massive in intellect, the man of whom we had heard and read but whom we had not expected to see standing upon our sandy soil. He soon took his seat again in the coach and passed out from us on to Michigan City. Webster proceeded to Michigan City to enjoy Independence Day celebrations in that small community. James L. Monahan, when interviewed by Brennan, recalled Webster's visit to City West. Monahan was twelve years old at the time and he remembered that Webster's speech was given at the mouth of Fort Creek (now called Dunes Creek) and that Webster stated "he was booming in Congress [for City West] as the place for a government harbor." Monahan indicated that when Webster went to Michigan City he stated "that Michigan City would be the greatest city on the [Great] lakes" during his speech. 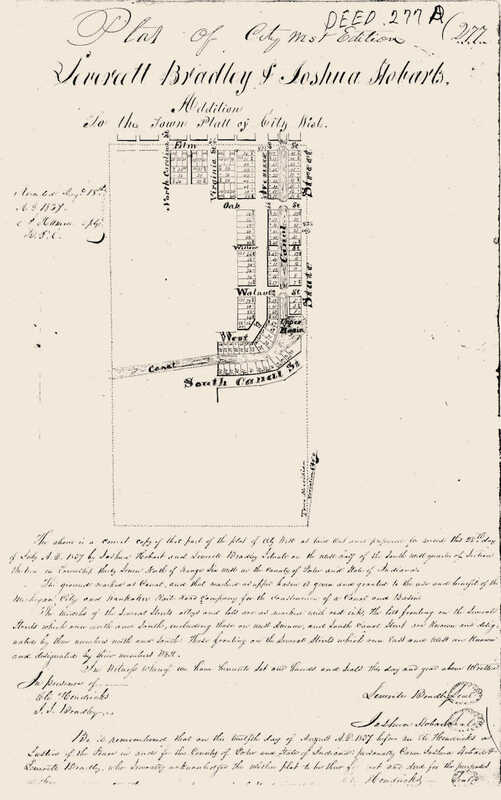 Like the citizens of City West, Michigan City residents attempted to curry Webster's favor by gifting him a plot of land on what was going to be the community's business street. Essentially, Webster was a paid lobbyist. His efforts were used in an attempt to secure state and/or federal funding for the survey and construction of a harbor, canal, and lighthouse facility at City West, Michigan City, and elsewhere. For City West, funds of these sorts were never secured. The day following Webster's Michigan City speech, Monahan relates to Brennan that he was driving his ox team along a corduroy road leading away from Michigan City when he saw a stage coach with a four-horse team running at full speed. The road was rough, consisting of hewn logs, planks, and brush, and the stage coach was rocking "frightfully." As the stage coach passed Monahan, he saw Webster and heard him "singing at the top of his voice." Monahan believed Webster to be under the influence of alcohol. A few weeks after Webster's visit to City West and Michigan City, the legislatures of Indiana and the United States had taken up bills that included funding for the development of harbors along Indiana's Lake Michigan shoreline. The Indiana legislature passed a bill appropriating $3,000 to complete a lighthouse facility at nearby Michigan City. The federal government, meanwhile, appropriated $30,000 for harbor construction at Michigan City, $40,000 for harbor improvements at Chicago, and no funding for either City West or Indiana City. The following year, 1838, was quite eventful with respect as to whether City West would develop into a populated center of prominence. Most pressing was the need for the community to quickly secure public funds to invest in harbor development and a lighthouse. This was especially true given that the financial crisis of 1837 essentially wiped out any hope for development from private interests. It should be noted that the Panic of 1837 was one of the most significant financial crises in American history. It resulted in a very substantial decline in real estate prices and a national recession that lasted well into the mid-1840s. The fateful question was whether various petitions and requests for government appropriations would be granted to develop City West? Below is a time line summary of legislative activities related to the acquisition of appropriations for developing a harbor facility at City West. January 15, 1838: Jacob Bigelow, along with 315 citizens of Northern Indiana, petitioned the United States House of Representatives "praying an appropriation for a harbor at City West, at the head of Lake Michigan, in the State of Indiana." In addition, "John Baldwin, and others, masters and owners of vessels, shipping merchants, and others, interested in the trade of Lake Michigan" also requested an appropriation for a harbor at City West. These two petitions were forwarded to the Committee on Commerce. February 8, 1838: The Topographical Bureau of the United States Department of War publishes a report concerning the development of a harbor at City West. The report was prepared by Thomas Baylis Whitmarsh Stockton, U.S. Civil Agent, and submitted to Colonel John James Abert of the Topographical Bureau. 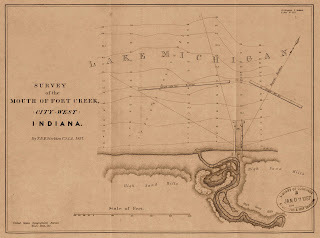 Stockton includes a plat of the survey of a harbor carried out in 1837 and writes that, relative to a harbor at Michigan City, the City West harbor would require "a greater quantity of excavation and dredging" in order to "construct a basin" and "this will cost more to construct it." Stockton also notes that a significant sandbar exists offshore that would increase harbor development cost; the total cost for improvements was estimated to be $150,000. One paragraph of the report essentially condemned City West's future. Stockton reports that if the sandbar extends along the entire bend at City West, then "any improvement, south of this bar, would, in a public point of view, be entirely useless. My reason for crediting this report is this: the present shore of the head of Lake Michigan is formed of immense sand hills, in rear of which are ponds or marshes, extending entirely around the head of the lake, and separating these fills from the main land, or what has once been lake shore." February 19, 1838: The United States Senate is petitioned for an appropriation for a harbor at City West by Daniel Webster. While Webster's request was taken up for debate, it does not appear that a vote was ever taken for an appropriation. Also on this particular date, the Senate received Stockton's from the Department of War in relation to a harbor at City West. July 18, 1838: Representatives from Michigan petition the United States House of Representatives to appropriate $5,000 "For erecting a light-house at New Buffalo, on Lake Michigan, instead of one at City West, provided for by an act in 1837." They may have been motivated to present their petition on the basis the information contained in the report prepared by the Topographical Bureau of the Department of War. estimating the potential for harbor development at City West. Source: Topographical Bureau, Department of War, February 19, 1838. It appears that after July 18, 1838, little or no action was taking place with regard to either Indiana or the federal government appropriating funds for the establishment of a harbor at City West. In fact, evidence suggests that legislature of Indiana was actively attempting to avoid funding harbor development by making such funding the responsibility of the federal government. On March 2, 1839, a General Assembly of Indiana resolution to the United States House of Representatives and Senate was presented and ordered printed with the focus to "Obtain an appropriation for the improvement of the harbor of City West." No debate occurred and no vote was taken, however, to provide the funds requested. Again, in 1844, the General Assembly of Indiana, in a seemingly last-ditch effort to develop City West, delivered a joint resolution to the United States House of Representatives "to urge upon the present Congress the necessity of an appropriation for the purpose of building a light-house at the harbor of City West, in Porter county." This resolution was forwarded to the House Committee on Commerce, where it gained no traction and died at committee. 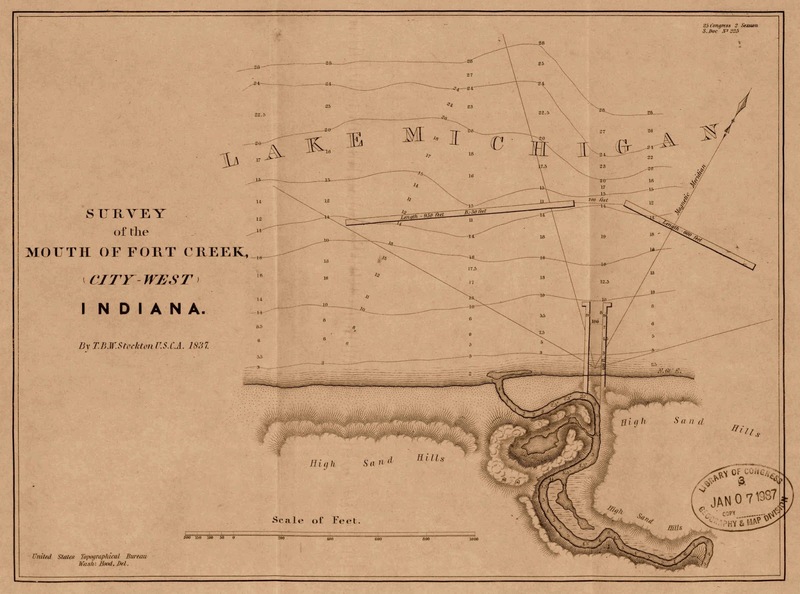 Other than the United States Department of War's expenditure to survey the shoreline and Fort Creek to determine the feasibility of developing a harbor, it appears that no funds were ever appropriated by the legislators of either Indiana of the federal government for port facilities at City West. City West was doomed. It should be noted that a post office was established at City West on June 23, 1838, with Leverett Bradley serving as its first postmaster. It was the fourth post office established in Porter County, following Coffee Creek (January 29, 1835; now Chesterton), Salt Creek (February 13, 1836; closed May 23, 1836), Portersville (March 14, 1836; now Valparaiso), and Tassinong (April 10, 1838; closed June 30, 1903). 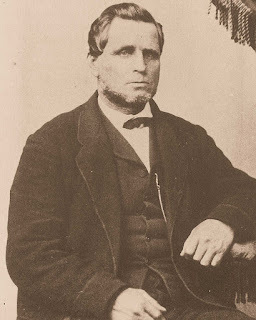 Samuel Sterling was appointed as the second postmaster of City West on December 29, 1843, followed by Thomas Jefferson Field on March 19, 1844. An indication of the final demise of City West was demonstrated by the closure of the City West post office on November 5, 1849. Only traces of information exist to provide clues as to what happened to City West when its residents dispersed elsewhere. In 1845, a new community was formed approximately one mile to the southeast of City West called New City West. Various descriptions of New City West indicate that at least twenty homes were built in this community centered around three businesses. These business included a sawmill owned and operated by Lansing Morgan, a cooperage owned and operated by David H. Hopkins, and a small brickyard. Lansing Morgan, who resided in Elgin, Kane County, Illinois, became a significant landowner in the dunes region. Note that Lansing does not appear to be related to the pioneering Morgan family of Porter County. He eventually came into ownership of all of the original City West real estate, as well as 140 acres directly south that was adjacent to New City West. of City West where he operated a sawmill, exporting lumber to Chicago. Source: Find A Grave, Memorial No. 128977252. Morgan installed a short railroad line that ran from New City West to his sawmill and then proceeded on to the beach where he had constructed a six hundred foot long pier into Lake Michigan. Morgan would haul eastern white pine logs on his rail line to the sawmill, and then haul lumber to the pier. Morgan owned at least two ships that plied the Lake Michigan waters transporting lumber to Chicago, one of which was destroyed at a dock during the great Chicago fire of 1871. 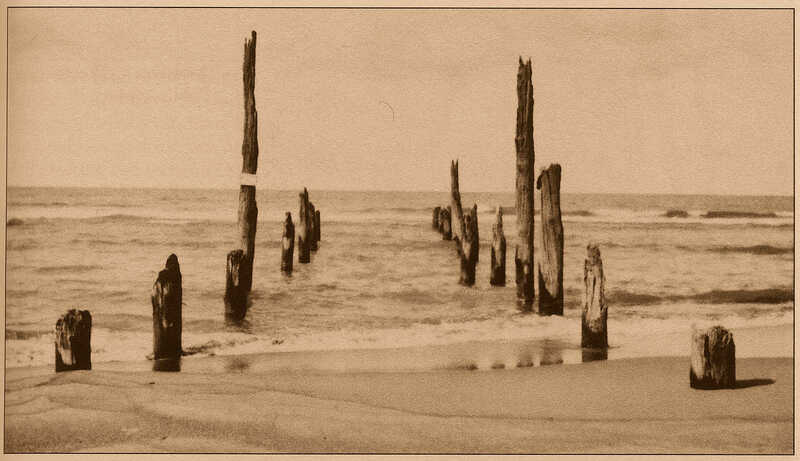 Some years after [City was deserted], a pier was built and some traffic in lumber began at this point. Still, the pier stands as the years go by. Fresh timber fall and the waves are wearing away its foundations. It is a pleasing custom of the students and alumni of the High School to resort there in the summer season, in their picnic parties. Many of them have shown remarkable daring in springing from timber to timber, where the connection was broken and passing themselves above the deep surges. 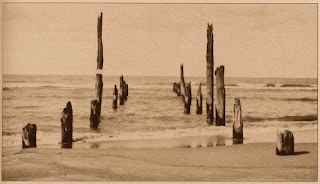 Remnants of the Lansing Morgan's pier, which was located about one-half mile east of the present day pavilion, were still visible in 1925.
pier at City West used to load ships with lumber for the Chicago market. Source: Images of America, Westchester Township, 1999. From 1850 to 1870, Alanson Green owned and operated a tavern at New City West. Stage lines used Green's tavern as a stopping point, allowing passengers to dine at the tavern while fresh horses where exchanged on the stage coaches. Green also used the tavern as a station on the underground railroad, assisting runaway slaves making their journey to to Canada and freedom. The immediate area surrounding New City West was still quite primitive in the 1850s. Given this relative remoteness, crimes could be committed in the area and go unnoticed, as indicated in the newspaper item below published in Valparaiso's Practical Observer in 1850. City West that supposedly "came to death by some violence." Source: Practical Observer, October 30, 1850. In 1875, a boiler exploded and completely destroyed Lansing Morgan's sawmill. The sawmill was not rebuilt, which consequently had a negative impact on the New City West community. Many of the residents that were employed at the sawmill moved to where the job opportunities existed. Between 1880 and 1900, only a few individuals were residing in the City West-New City West vicinity. When City West and New City West were abandoned by their residents, land and any remaining structures were used by squatters and individuals with little financial means. Early newspaper items from Chicago to Michigan City report about hermits residing in the dunes region, often living in shanties or dugouts in the side of a sand dune. The death notice of Henry Carfac published August 29, 1889, in The Tribune provides an example of an individual squeaking out an existence in the dune country. Sad Facts To Send Inquiring Friends Regarding Henry Carfac. Last week inquiry was made, asking for information regarding Henry Carfac. We find that he was the poor crippled man who lived at City West. From his neighbors we learn that Carfac was an ex-union soldier, who died in his shanty at City West from starvation. He was the worst crippled-up man that ever appeared in this section. His body was drawn and twisted out of shape, and when he walked he did so with one arm leaning heavily on one knee. His disease was contracted in the army. Some time before he died, he was taken sick and sent to the Porter county poor house. Recovering, he came to City West and bought a small piece of land, two acres, I think, of Mr. Furness, promising to pay $25 for it. Here he lived alone, but how, no one will ever know. He was unable to work, and his visible income was $4 a month, from the trustee. Some time before he died Mr. John T. Taylor, now of Guthrie, I. T., interested himself in the poor old man, and tried to get him a pension. He had a photographer take a picture of Carfac and sent it to the pension department together with good evidence supporting his claim. But while the wheels of that great institution were going round, poor Carfac died before his name was reached. So poor was he that when Assessor Coulter went to assess him he walked away without doing so. "Why, I wouldn't have given him twenty cents for his entire outfit," said Coulter. An old man who lived next to Carfac, on being asked what ailed the old man, bluntly replied, "He didn't get enough to eat." The old man has relatives in Ohio, who are now making inquiries about him. Their impression is that he was wealthy, owning farms near Chesterton and Valparaiso. The truth will rudely shock their expectations of inherited wealth, I fear. Alice Mabel Gray, more romantically known as Diana of the Dunes, was another squatter in the dunes region. Unlike the majority of squatters, however, Gray made the conscious effort to live in a natural and primitive environment despite having the wherewithal to live in a developed community with modern conveniences. Newspaper item concerning the discovery of a "Mystic Nymph"
to be Alice Mabel Gray, or Diana of the Dunes. Source: The Chicago Daily Tribune, July 22, 1916. In 1891, Orville J. Hogue of Chicago platted about 100 acres immediately west of City West, where Porter Beach is located today, called the Lake Shore Addition to the New Stock Yards (Porter County Recorder's Office, Miscellaneous Book R, Page 103). Hogue's plat contained hundreds of lots measuring twenty-five feet by one hundred feet. Streets within the plat were given such names as Clark, Dearborn, Michigan, and State, names of well known streets already existing in downtown Chicago. It has been speculated that Hogue intentionally misled buyers into believing that they were purchasing real estate near the Chicago stockyards, which at that particular time were booming with business and expanding rapidly. Those who purchased Hogue's stockyard lots, sight unseen, eventually learned about the nature of their purchase. Many buyers simply abandoned their property, which would then be auctioned by Porter County in tax sales. Quiet title actions were taking place as late as 1962 in the Porter County Circuit Court to straighten out the ownership of Hogue lots. Hogue's real estate shenanigans were not confined to the dunes region. The Daily Inter Ocean, a major Chicago newspaper, reported in its January 9, 1892, issue that Hogue recorded a plat titled Hogue's Addition to Harvey. Harvey, situated in Cook County, Illinois, was rapidly growing in the 1890s. A slight disadvantage is suggested by the plat with the Recorder, in that no street frontages are shown, and in size of but 25x66 feet for each lot. But, by means of balloons, ingress and egress would be possible, while, as nobody but a millionaire wants a house larger than 25x65 feet. The size is sufficient. By the very early 1900s, what remained of New City West was being nearly universally referred to as Tremont in reference to the three prominent sand dunes located north of the area; namely, Mount Holden, Mount Jackson, and Mount Tom. Mount Jackson was previously known as Mount Green, presumably after Alanson Green, but at some point in time the name of this sand dune was changed. Tremont and the former location of City West was fast becoming a destination site for summer tourists, mostly being individuals from the Chicago area seeking a change of pace in the peaceful, rural dune country. In 1911, the Prairie Club, a Chicago recreation-oriented organization, was incorporated and this group soon began aggressive efforts to preserve the dunes region as a state or national park. As previously mentioned, David Hopkins owned an operated a cooperage at New City West that employed about forty men. In 1850, the village of Coffee Creek, southwest of New City West, was growing and had changed its name to Calumet. Perhaps sensing greater opportunities at Calumet, Hopkins moved his business there and, consequently, assisted in the depopulating of New City West. The community would change its name once again in 1870 to Chesterton due to confusion created by the existence of Calumet City in Cook County, Illinois, located thirty miles to the west. The Exchange Hotel located in City West to Calumet (renamed Chesterton in 1870). At some point in the early 1850s, probably during the winter of 1853-54, Hopkins moved the abandoned Exchange Hotel from City West to Calumet. The hotel was lifted, placed on skids, and then pulled by oxen over snow. Hopkins had the hotel structure placed at the southwest corner of the intersection of Second Street and Broadway. He then leased his property, which was operated as the Central House Hotel. In 1854, all of the remaining structures in City West were destroyed by a fire that was caused by an electrical storm. Thus, City West suffered the same fate as Liverpool and Waverly - wildfire. After Hopkins' death at Chesterton in 1870, the structure he moved there continued to serve as the Central House Hotel - Chesterton's primary hotel for nearly 54 years. Eschenbach's Hotel and Restaurant and Arthur E. Nickel's drug store and dental office also operated from the the structure for short periods of time. Church is visible immediately south of the hotel; Hopkins built the church. housed in the former Exchange Hotel from City West, circa 1907. At 2:00 am on Tuesday, April 7, 1908, the Central House Hotel was destroyed by a blaze that originated on the second floor. The Johnson Brothers store, adjacent to the hotel, suffered $5,000 in damages, while Bartel's Hardware also suffered significant damage from the fire. 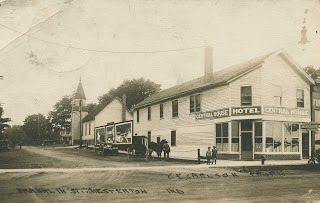 At that time of the structure's demise, Gust Lawson was the owner of the hotel. Tribune announcing the loss of the "last vestige of City West" to fire. Since that time Bill, as he is affectionately called by his newspaper colleagues, has charmed and attracted a large following with his interesting and intriguing series of "Stories of Porter County." An accomplished journalist and writer, Wallace used his ingenuity and creativity to eliminate the usual "dryness" of historical accounts. Dressed up in an original Wallace styling, his accounts carried a triple impact to his readers, containing true historical matter, some partially true, and some legendary. In the annals of The Vidette-Messenger, there has been no local series of articles which have created reader interest more than those submitted during the past seven years by one of the most versatile and talented Porter county writers. The vast majority of Wallace's columns contained plenty of fabrications and factual misrepresentations. A reader of The Stroller columns, however, could easily assume that what Wallace had written was indeed true since the columns failed to include a disclaimer clearly indicating that elements of Wallace's stories were fiction (i.e., legend). Consequently, some fiction written about Porter County by Wallace has been perpetuated by later writers as fact. Three columns were published under The Stroller byline that focused squarely upon the history of City West. The first two of these columns were largely accurate with regard to facts. However, the third column, published on March 20, 1962, was almost entirely fiction. 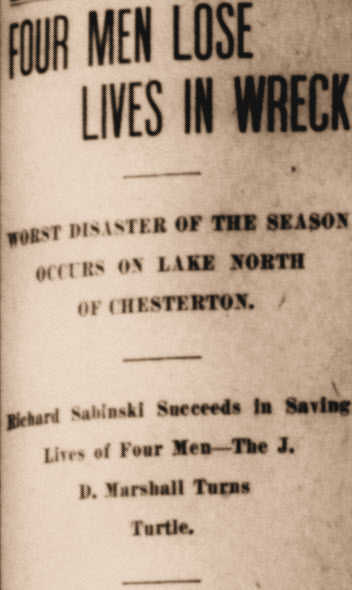 This column tells the story of a freighter on Lake Michigan called City West that sank just offshore from the former village of City West on June 16, 1911, due to a "mid-summer hurricane." Named for the one-time proposed harbor city or City West -- and originally intended to haul fire-wood, swamp hay, grain, furs and hides and lumber from City West to Chicago -- it was at the time of its loss older than the proverbial three-score-years-and-ten. At the time of the collapse of the town of City West the ship moved to Detroit and was for 50 years a coastwise freighter to Saginaw Bay. It had changed hands many times and had been converted to steam. But its name [City West] was never changed. Somewhere off the shore of the long abandoned town known as City West the little vessel that once belonged to that town, and that bore its name for 74 years, lies on the bottom of the lake and here on land lie the bodies of its crew members. A strange coincidence surely, but no stranger than thousands of sea-farers tales that fill the pages of maritime history. The freighter City West was wrecked off Porter county shore line June 16, 1911, not far from the place it first served humanity. Its crew of nine lie buried up and down the beach, where they were discovered in the period from June 27 to Aug. 7, 1911. Its loss probably takes from the earthly scene the last relic of that famous town-site that once dared to challenge Chicago for the first place among land-end ports -- City West a name that will long be a port of Porter county's history. 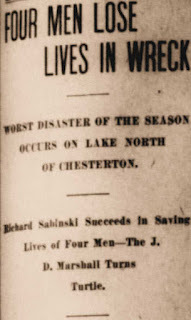 There was never a ship named City West that sank in Lake Michigan on June 16, 1911. A Lake Erie Boat Yard never existed. The publisher of The Chesterton Tribune, Arthur J. Bowser, never published a column concerning the sinking of a freighter named City West. Bodies were never buried along the beach where they had washed ashore after the alleged shipwreck. Wallace's story is simply untrue, but it has been assumed factual by later writers of the area's history [one example is Lakefront Legacy by Bob Kaser, published on the Michigan City Public Library website]. The single kernel of truth in Wallace's story is that a ship did indeed sink off the shore of City West in June 1911. That ship was the J. D. Marshall, a sand ship, which was lost directly north of the City West's shoreline on June 11, 1911.
shore of City West, Indiana, on June 11, 1911. Source: Indiana Department of Natural Resources. 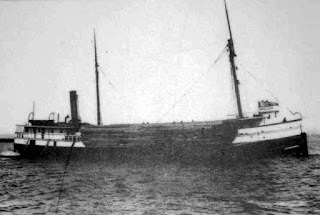 The 154.5 foot long and 33.5 foot wide J. D. Marshall was a 531 ton steamer launched on July 4, 1891, and built by Captain J. C. Pereue at the Martel Boatyard in South Haven, Van Buren County, Michigan. The ship's first owner, Captain Pereue used the vessel to transport lumber. The ship was later owned and operated by Williams Transport Company, followed by J. O. Neeson & Company. At the time that the ship was lost, the Independent Sand & Gravel Company was owner of the vessel. Tragically, four men of the crew of ten died - three men were trapped inside the capsized the ship and drowned and a fourth man was found dead floating on the water. the J. D. Marshall at City West, Indiana. Source: The Chesterton Tribune, June 15, 1911. On the day of the disaster, the J. D. Marshall was operating several hundred feet north of the present day pavilion at the Indiana Dunes State Park. Using a suction system, the ship was taking on about 400 cubic yards of sand when it sprung a leak at 5:00 pm. As the ship was anchored, a storm struck and the sand shifted within the hull causing the vessel to capsize. Contemporary reports state that the overturned ship remained floating for several days and was a local attraction till it finally settled to the bottom of the lake. Today, the remains of the J. D. Marshall still rest on the bottom of the lake, approximately 1,800 feet north from the pavilion shoreline. The ship's one hundred acre debris field is an official Indiana Nature Preserve and disturbing or removing items from the site is prohibited. Baker, J. David. 1976. The Postal History of Indiana, Volume II. Louisville, Kentucky: Leonard H. Hartmann. ,061 p.
Bowers, John O. 1929. "Dream Cities of the Calumet," in (pp. 174-198) History of Lake County. Volume 10. Gary, Indiana: Lake County Historical Association (Calumet Press). 223 p.
Colton, Joseph Hutchins. 1860. Colton's Map of the State of Indiana, Compiled from the United States Surveys & Other Authentic Sources, Exhibiting Sections, Factional Sections Railroads, Canals &c. New York, New York: J. H. Colton. 1 p.
Edwards, Janet Zenke. 2010. Diana of the Dunes: The True Story of Alice Gray. Charleston, South Carolina: History Press. 157 p.
Evans, Thomas J., and David Hillis. 1839. Resolutions of the General Assembly of Indiana, to Obtain an Appropriation for the Improvement of the Harbor at City West. Senate Document 295, 25th Congress, 3d Session. Washington D.C.: Blair and Rives, Printers. 1 p.
Menke, Louis A. 1952. "The Story of Chesterton," in (pp. 7-8) Chesterton Centennial 1852-1952. Chesterton, Indiana: The Chesterton Centennial, Inc. 104 p.
Oglesbee, Rollo B., and Albert Hale. 1908. History of Michigan City, Indiana. LaPorte, Indiana: Edward J. Widdell. 220 p. [see p. 129]. Poinsett, J. R. 1838. Report from the Secretary of War in Compliance with a Resolution of the Senate of the 14th Instant, Transmitting a Copy of the Survey of the Harbor of City West. Senate Document 225, 25th Congress, 2d Session. Washington D.C.: Blair and Rives, Printers. 3 p.
Robinson, A. L., and Jesse D. Bright. 1844. Resolutions of the Legislature of Indiana, Relative to the Construction of a Light-House at City West Harbor. House of Representatives Document 130, 28th Congress, 1st Session. Washington D.C.: Blair and Rives, Printers. 1 p.
Skinner, Hubert M. 1878. Complete History of Porter County, Indiana. Valparaiso, Indiana: Valparaiso Messenger. Anonymous. 1875. Obituary - Dr. Leverett Bradley. The Medical and Surgical Reporter 33(17):340. Gordon, Leon M., II. 1951. Settlements in Northwestern Indiana, 1830-1860. Indiana Magazine of History 47(1):37-52. Kaufmann, Kira E. 2013. Hoosier History in the Deep: Survey of Lake Michigan Historic Shipwrecks in Indiana's Waters. Indiana Archaeology 8(1):72-103. McMahon, David. 1997. Rediscovering a Swedish Ethnic Past: The National Park Service and Baillytown, Indiana. Swedish-American Historical Quarterly 48(1):26-52. Shoemaker, Rebecca S. 1988. Michigan City, Indiana" The Failure of a Dream. Indiana Magazine of History 84(4):314-342. The Weekly Mississippian, Jackson, Hinds County, Mississippi; July 28, 1837; Volume 6, Number 21, Page 1, Columns 3 and 5. Column titled "Laws of the United States. State of Indiana." The Madisonian, Washington, D.C. January 16, 1838; Volume 1, Number 55, Page 3, Column 1. Column titled "House of Representatives. Monday, January 15." Richmond Enquirer, Richmond, Henrico County, Virginia; February 17, 1838; Volume 34, Number 89, Page 2, Column 2. Column titled "In Senate. Wednesday, Feb. 14, 1838." Richmond Enquirer, Richmond, Henrico County, Virginia; February 24, 1838; Volume 34, Number 92, Page 2, Column 2. Column titled "In Senate. Monday, Feb. 19." The Madisonian, Washington, D.C. February 14, 1839; Volume 2, Number 60, Page 2, Column 6 and Page 3, Columns 1-2. Wabash Courier, Terre Haute, Vigo County, Indiana; February 5, 1842; Volume 10, Number 22, Page 2, Column 5. Column titled "Agricultural. Vineyards in the West." Pittsburgh Gazette, Pittsburgh, Allegheny County, Pennsylvania; February 16, 1844; Volume 59, Number 21, Page 1, Column 2. Column titled "Congress." Practical Observer, Valparaiso, Porter County, Indiana; October 30, 1850; Volume 2, Number 14, Page 2, Column 2. Column titled "Body of Man Found -- Supposed Murder!" Daily National Republican, Washington, D.C.; February 23, 1864; Volume 4, Number 75, Page 2, Column 6. Column titled "United States Court of Claims." The Evening Journal, Jersey City, Hudson County, New Jersey; September 7, 1875; Volume 9, Number 109, Page 1 Column 1. Column titled "Death of Dr. Leverett Bradley." The Tribune, Chesterton, Porter County, Indiana; March 26, 1885; Volume 1, Number 52, Page 1, Column 5. Column titled "Robert Warren." The Tribune, Chesterton, Porter County, Indiana; August 29, 1889; Volume 6, Number 20, Page 1, Column 4. Column titled "Neglected Veterans: Sad Facts to Send Inquiring Friends Regarding Henry Carfac." The Tribune, Chesterton, Porter County, Indiana; January 15, 1891; Volume 7, Number 40, Page 5, Column 1. Column titled "News of the Week." The Daily Inter Ocean, Chicago, Cook County, Illinois; January 9, 1892; Volume 20, Number 291, Page 9, Column 1-2. Column titled "Hogue's Addition to Harvey, in Palo's Four Acres, 106 Lots." The Westchester Tribune, Chesterton, Porter County, Indiana; October 23, 1897; Volume 14, Number 28, Page 5, Column 4. Column titled "Chesterton Chips." The Chesterton Tribune, Chesterton, Porter County, Indiana; April 9, 1908; Volume 25, Number 2, Page 1, Column 1-2 and Page 8, Columns 1-3. Column titled "$10,000 Fire Devastates Last Vestige of City West, Once a Hopeful Rival of Chicago for Mercantile Supremacy of West." The Chesterton Tribune, Chesterton, Porter County, Indiana; June 15, 1911; Volume 28, Number 12, Page 1, Columns 1-2. Column titled "Four Men Lose Lives in Wreck." The Indianapolis News, Indianapolis, Marion County, Indiana; December 30, 1915; Volume 67, Number 21, Page 3, Columns 4-5. Column titled "Sand Dunes Contain Ruins of Cities That Might Have Been." The Chicago Daily Tribune, Chicago, Cook County, Illinois; July 22, 1916. Volume 75, Number 175, Page 13, Column 2. Column titled "Mystic Nymph in Wild Dunes." The Vidette-Messenger, Valparaiso, Porter County, Indiana; March 30, 1928; Volume 1, Page 1, Column 2. Column titled "Help! Help! Gary Post Tribune Says Facts Were Twisted." The Vidette-Messenger, Valparaiso, Porter County, Indiana; April 9, 1928; Volume 1, Page 1, Columns 3-5. Column titled "Dunes Park Region, Formerly Known as Old City West; Musty Records Reveal Its History." The Vidette-Messenger, Valparaiso, Porter County, Indiana; May 2, 1932; Volume 5, Page 2, Column 2. Column titled "Help! Help! Gary Post Tribune Says Facts Were Twisted." The Vidette-Messenger, Valparaiso, Porter County, Indiana; January 17, 1935; Volume 8, Page 1, Columns 4-5 and Page 4, Column 5. Column titled "Chicago's Rivals - Part 1," by W. A. Briggs. The Vidette-Messenger, Valparaiso, Porter County, Indiana; March 7, 1935; Volume 8, Page 1, Columns 4-5 and Page 3, Columns 1-2. Column titled "New City West," by W. A. Briggs. The Vidette-Messenger, Valparaiso, Porter County, Indiana; August 18, 1936; Volume 10, Section 1, Page 12. Column titled "City West and Indiana City, Now gone and Almost Forgotten Were Once Rivals of Chicago." Warsaw Times-Union, Warsaw, Kosciusko County, Indiana; October 20, 1953; Column titled "Our County History," by Marion W. Coplen. The Vidette-Messenger, Valparaiso, Porter County, Indiana; December 5, 1955; Volume 29, Number 130, Page 1, Columns 6-7 and Page 6, Column 3. Column titled "Historian Relates How City West Lost Out On Harbor Funds In 1837," by The Stroller (William O. Wallace). The Vidette-Messenger, Valparaiso, Porter County, Indiana; March 29, 1957; Volume 30, Number 226, Page 1, Column 1 and Page 6, Column 1. Column titled "City West's Failures Recounted," by The Stroller (William O. Wallace). The Vidette-Messenger, Valparaiso, Porter County, Indiana; January 2, 1960; Volume 33, Number 152, Page 1, Columns 4-5 and Page 8, Columns 3-4. 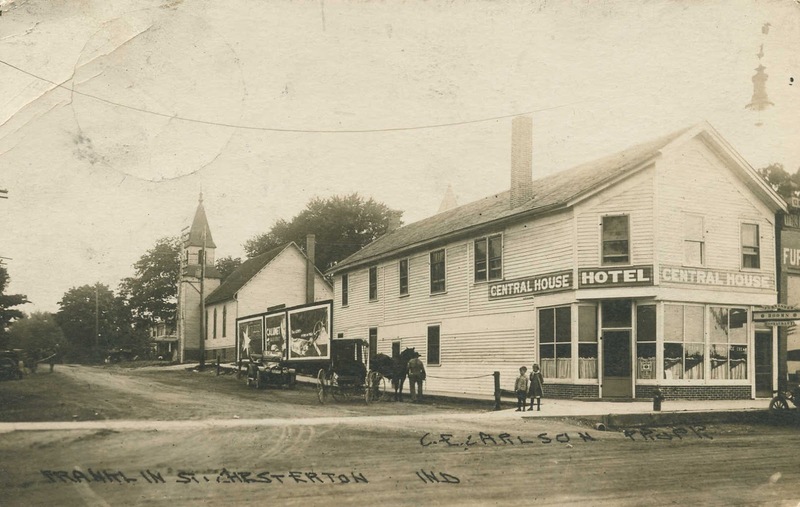 Column titled "History of Chesterton's Central Hotel Interesting," by The Stroller (William O. Wallace). The Vidette-Messenger, Valparaiso, Porter County, Indiana; March 20, 1962; Volume 35, Number 218, Page 1, Columns 4-5 and Page 5, Columns 1-3. Column titled "City West Freighter is Wrecked Off Dunes Shore," by The Stroller (William O. Wallace). The Vidette-Messenger, Valparaiso, Porter County, Indiana; June 22, 1962; Volume 35, Number 298, Page 1, Columns 6-8 and Page 6, Column 3. Column titled "Stroller Ending Series," by Rollie Barnhart. The Times, Munster, Lake County, Indiana; February 16, 1999. Column titled "City West's Success Sank with Lost Harbor," by Archibald McKinlay. I am interested specifically in the lease back parcels located in Tremont. I would like to find out more about individual parcels and the program in general. Could you point me in the right direction?